Dr. Devan Dalla of Ora Dentistry in Elk Grove, CA has recently been awarded as a 2019 Top Patient-Rated Dentist by Find Local Doctors. Find Local Doctors is a trusted online directory that recognizes physicians and dentists who have earned superior reviews from their actual patients. My patients are the measure of my success. This recognition serves as an affirmation that we are doing our job to provide superior dental care to the Elk Grove community, says Dr. Devan Dalla of Ora Dentistry. Ora Dentistry is full-service dental practice with a mission to provide the highest standard of dental care in a rewarding and comfortable environment. To this end, the Elk Grove office is equipped with modern dental technology, relaxing amenities and staff of dental professionals who adhere to superior, patient-centered care. Among the team members is lead dentist Dr. Devan Dalla. He brings trusted experience and diverse training, equipping him to provide all aspects of dental care in one convenient place, from routine dental cleanings to the most advanced dental implants technology to Invisalign clear aligners. The unwavering focus on individualized care combined with the expansive range of services available at Ora Dentistry have undoubtedly contributed to the number of excellent patient reviews left for Dr. Dalla across multiple online sources. For the second consecutive year, Ora Dentistry has been named a Top Patient-Rated Elk Grove Dentist. Find Local Doctors gives this award to a select group of dentists who have consistently earned five-star ratings from their actual patients. Find Local Doctors is a credible online directory that connects consumers with local physicians and dentists who meet their criteria for qualifications and reputation. “My patients are the measure of my success. This recognition serves as affirmation that we are doing our job to provide superior dental care to the Elk Grove community,” says Dr. Devan Dalla of Ora Dentistry. Beyond the comprehensive menu of dental services at Ora Dentistry, there is also an undeniable dedication to patient comfort. This includes a pampering, “spa-like” experience complete with warm scented towels, complimentary beverages, wireless headphones and neck pillows. The Elk Grove office also offers flexible scheduling including family block appointments as well as Saturday and evening availability. Ora Dentistry is located 2733 Elk Grove Boulevard in Elk Grove, California. Dr. Deval Dalla is a graduate of New York University College of Dentistry and has been in practice since 2008. While at NYU, Dr. Dalla was awarded Honors in Implantology as well as the Dr. Bernard E. Rudner Memorial Award for demonstrating superior Clinical Performance in providing comprehensive oral care. Prior to moving to the United States, Dr. Dalla earned a Bachelor's Degree in dental surgery from one of the leading dental schools in India and graduated top of his class. Dr. Dalla is an active member of multiple dental affiliations including the American Dental Association (ADA) and the American Academy of Implant Dentistry (AAID). He has a genuine passion for dentistry and for treating patients with the individualized attention they deserve. Dr. Dalla is currently practicing dental surgeon who is also serving our country as a Captain in the United States Army Reserve. 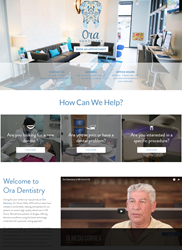 For more information about Dr. Dalla or the services he offers at Ora Dentistry, please visit http://www.oradentistry.com or call (916) 975-1000.